The answer is simple: I wish I knew about fixed-term memberships back in the late 90’s so I could have built a residual income base much earlier in my “career” than I actually did. SIDEBAR: “Fixed term membership” is a phrase that I personally created and introduced to the internet marketing crowd, although the concept itself wasn’t original to me. A “fixed-term membership site” (FTM) consists of content shared via autoresponder to paid members for a specified period of time. There are a variety of reasons why a fixed term membership is a better model than the “traditional” membership site that are explained at the above referenced site, so I won’t go into them here. But perhaps the most significant is the fact that all you need is that FIRST LESSON created in order to launch the site, as opposed to needing a bunch of content to stockpile a “traditional” membership site. That’s important because you LITERALLY can have a FTM up and running in just a couple of days. What I want to teach you in this article is a simple way to quickly setup an FTM site without writing a word of the content. Step 1: Buy Quality PLR Content. It begins with purchasing a private label rights license to “quality” content. Choose this carefully as you’ll be converting it into your membership site lessons. You want it to be first rate since your name is going to be attached with it in the end. A) Look for content that “teaches a process”. In other words, you want content that is very “how to” in nature. The materials you purchase PLR to sell should teach the reader how to accomplish a desirable result. Examples: How To Build A List, How To Lose 20 Pounds, How To Shave 10 Strokes From Your Golf Game, etc. This is important because the “fixed term” model works best when your members learn a series of steps for reaching a desired end result. C) Look for content that is lengthy enough to be divided into at least 12 lessons of 5-9 pages each. In other words, you’ll need 50-100 pages of meaty content to use for a 3-month FTM site that offers members weekly lessons. Step 2: Extract Marketing Materials. After you’ve purchased the content, you’ll want to “extract” some marketing materials. By “extract” I simply mention that you take out small portions of the content and convert them into a variety of marketing materials. A) The default recommendation that I generally make is this: you want 2-3 ezine articles, 4-5 short blog posts (think “tips”) and one short report (7-15 pages). B) If you can find PLR offers that INCLUDE bonuses specifically created to promote the content, that’s even better. The “best” PLR offers include marketing materials (in ADDITION to the product content itself) that were created specifically to promote the product you are licensing. These are your best options. You’ll use these extracted marketing materials to promote the FTM site once it is completed. Option 2: Get affliates and joint venture partners to distribute. Option 3: Be smart and do both of the above options. Step 3: Setup FTM Membership Site. The biggest part of your time will be used in actually setting up the FTM membership site. But, even that can be done in just a couple of days. A) Register a domain and secure hosting. B) Write the first lesson and set it up on a member autoresponder list. C) Create a sales page and a download page with access to the member list. That’s it. You’ve got an FTM site setup. So, that’s how you use PLR content to setup an FTM site. The overall model here is solid. It’s an easy way to create residual income from scratch virtually anytime you want to do so. If you locked me in a room with no content on my computer at all, I could have an FTM site setup in less than 24 hours using this model. I’m guessing that any intermediate marketer could do it in 72 hours and certainly in less than a week. If you’re looking for the kind of content that I’ve been talking about, then you’ll want to check out Membership To Go. It’s a complete, one-year fixed term membership site that you can license for your own use. This has never been offered before and it includes EVERYTHING you need to get started, including private label rights to the membership content, its sales letter, presell report, articles and other marketing materials. Set it up at your site, sell as many memberships as you want, keep 100% of every sale. 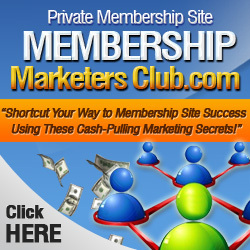 A fixed-term membership site is the ultimate “set it and forget it” way to generate income online. You create the site one time and it basically runs on autopilot. Jimmy D. Brown is the founder of the PLR industry and creator of Membership To Go, an “everything included” membership site package that you can setup at your site and keep 100% of every sale you make.